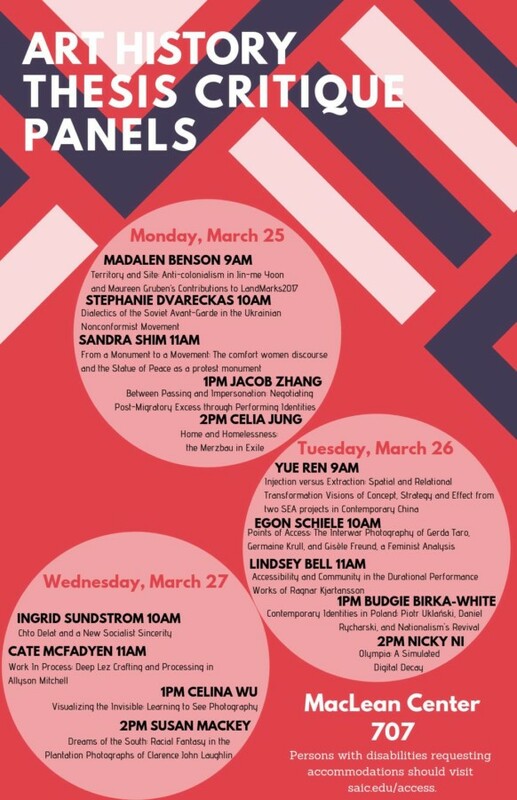 Please join the Department of Modern and Contemporary Art History, Criticism & Theory for three days of MA candidate thesis critique panels, in conjunction with SAIC’s annual Critique Week. Light refreshments will be provided, please email hblackstone@artic.edu with any questions or concerns. Students with disabilities requesting accommodations should contact saic.edu/access. Panelists: Professors Shiben Banerji, David Getsy, Seth Kim-Cohen, and Jennifer Nelson. Panelists: Professors Sampada Aranke, James Elkins, David Raskin, & Mechtild Widrich. Panelists: Professors Annie Bourneuf, Jenny Lee, Nora Taylor, & Bess Williamson.